Antimicrobial, restorative and strengthening. With its sweet, herbaceous and slightly green aroma, our Organic Sweet Thyme Essential Oil has more of a gentle restorative action than other thyme chemotypes. 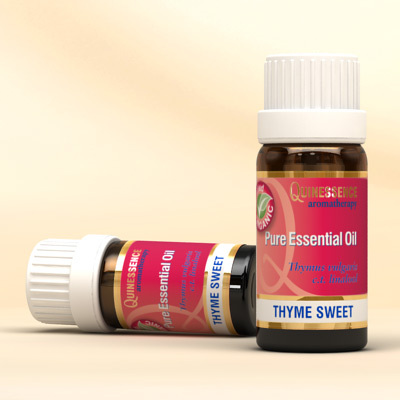 It still has strong antibacterial, antifungal and anti-infective properties, but these are not as pronounced as those found in the red and white thyme oils, making sweet thyme the preferable choice for use with children and the elderly. Organic Sweet Thyme Essential Oil is a highly effective neurotonic, which put simply means it gives a boost to the body's nervous system. It also has a pronounced immuno-stimulant action which helps to boost the immune system after, for example, a course of powerful antibiotics. It is quite common for antibiotics to weaken the body's natural defense system as well destroy invading bacteria, leaving you open to yet more infection. Chronic, lingering conditions respond well to Organic Sweet Thyme Essential Oil due to its restorative qualities that help to strengthen respiratory function, chronic fatigue and general debility. Its antispasmodic action helps to soothe a dry, hacking cough, and its antifungal action brings relief to a wide range of fungal infections. Organic Sweet Thyme Essential Oil can have a normalizing effect on obsessive emotions, helping to bring a sense of balance. Linalool, b-Caryophyllene, Linalyl acetate, Thymol, Geranyl acetate, g-Terpinene, Geraniol, Carvacrol.